Thought GoogleGoogleGoogleGoogle was just a typo of sorts? It's not! 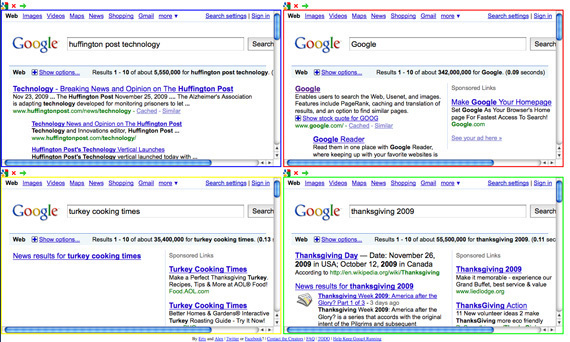 GoogleGoogleGoogleGoogle.com is a new website that has just launched allowing users to perform four Google searches at once in a single window. 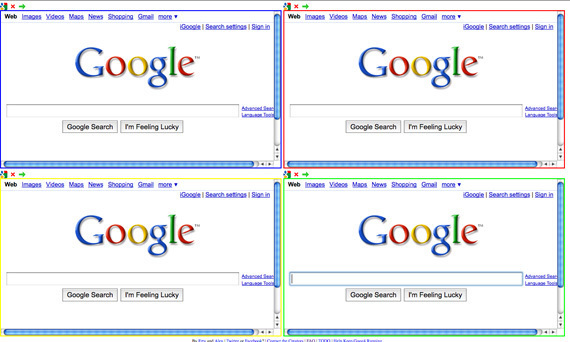 Alex and Erty were chatting on Google Talk one night, and Erty wondered if Googlegoogle.com was taken. He jokingly wondered if they could set up a search service for Google itself. Unfortunately, Googlegoogle.com was taken, but Alex pointed out that GoogleGoogleGooglegoogle.com was available. In a impulse buy, they purchased the domain (Alex already had some hosting) and someone had the idea of putting four Googles on the page. Thus, GoogleGoogleGoogleGoogle was born.